Formula One racing driver turned award-winning commentator, Martin Brundle has been competing in motorsport since 1971. His early days in grass track racing progressed to circuit success six years later at the age of 18. An opportunity to progress into single-seaters occurred two years later, which set him on an upward trajectory into Formula 3; and then ultimately into Formula One, a seat for which he secured from 1984-86. Victories in endurance racing at Daytona and Le Mans, as well as competition in European touring car championships and the American IMSA series punctuated Martin’s career before he returned to Formula One during 1992-96. Martin’s change of direction into commentating in 1997 was critically acclaimed, and is a career he enjoys to this day. However, endurance racing has continued to tempt him behind the wheel. For example, Le Mans assaults on behalf of Toyota in 1998 and 1999 in the TS020 (GT-One) led to a 3min 29sec pole position and an easy lead in the race, though on both occasions separate accidents forced his cars to be sidelined. We caught up with Martin shortly after he drove the GT-One up the famous hill climb course at Goodwood. Blog: Thank you for taking the time to talk to us, Martin. Now that you’ve had a chance to re-acclimatise yourself to the Toyota GT-One after a blast up the Goodwood Hill, what memories has that brought flooding back? Martin: The memories do all flood back – the ergonomics, the feel of sitting in it, the smell and when you fire the engine up it’s very distinctive. Racing cars like the GT-One are quite difficult to drive and today’s drive is very much a demo but you still want to give it a squeeze. It was really good to drive it all this time later. Blog: And how was it driving the car up the hill? Martin: To be honest, it was a bit of a handful – it’s not often a car like that drives on this kind of surface. Race tracks are normally billiard-table smooth and only cambered in one direction, unlike the track here which is a little rough and slopes off on both sides. Plus there is the flint wall halfway up which comes just as you drive into the shaded area – and you are guaranteed to lose if you have a fight with the wall. When you are going through a medium speed corner in this kind of car you have to remember where the apex is because when you’re close, the car is so compact that there’s not much visibility. It’s very easy to embarrass yourself and hard to impress when driving here – so you still have to take it a little bit carefully. Blog: When was the last time you drove the GT-One? Martin: I sat in the GT-One in the TMG museum in Cologne a couple of years back when I was making a Formula One TV feature, but the last time I actually drove it was in 1999 at Le Mans. I’m wearing my 1999 Toyota overalls today and that tells me that I’ve either kept in reasonable shape, or that I was too fat when I was driving! Blog: If you could rewind time and compete once again in the 1998 and 1999 Le Mans races in the Toyota GT-One, what would you do differently? Martin: There’s not much you’d change, because the car was great and we were doing well in 1999 up until we had a punture. It’s just one of those things. Having said that, one of my memories of the car was when we were qualifying for that race – we completely dominated but I made a tiny mistake in the final corner that stopped us from having a perfect lap. I still think about that from time to time, even now. Blog: You’ve been able to compete in Le Mans for a number of manufacturers over the years. Is there anything in particular that makes the Toyota GT-One stand out? Martin: What was really interesting about the GT-One period was that you had to make the cars road-legal so there was an element about it that meant it was not a pure race car, but at the same time those rules brought new challenges and made things incredibly complex. To make a car that was so fast but that met the rules of the road was really interesting – and it simply was so fast. Blog: What do you and the other professional drivers like about coming to Goodwood? Martin: What’s different to the drivers here is that we are not in competition. I love looking around as much as anyone else – there are drivers here like Sir Stirling Moss and Emerson Fittipaldi and they will enjoy this event as much as anyone else. There are priceless cars here and we’re all just as happy as the spectators are looking around the cars and enjoying them. So many of the cars you see here would normally be under a dust cover or in a museum somewhere, so it’s a really special event. Blog: Thank you for your time, Martin. We hope you enjoy the rest of the show. 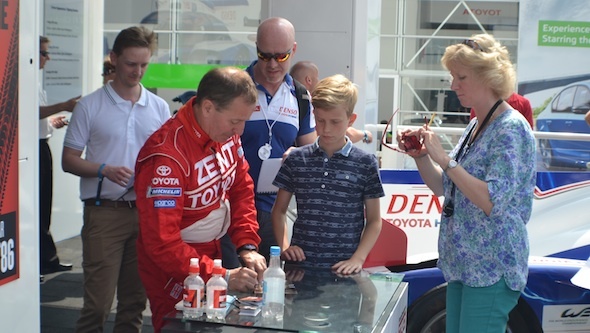 Read our interview with Martin’s GT-One co-driver Emmanuel Collard here, and current Toyota Hybrid Racing team member Alex Wurz here. See more of our Goodwood Festival of Speed content.